What makes a “best managed” company? According to the global financial services company Deloitte, companies with best-in-class business practices demonstrate exceptional strategy, capability, commitment, and return on investment. That’s why Oppy believes they have been named among Canada’s Best Managed companies for the last 18 years, and have been welcomed to the program’s Platinum Club a dozen years ago. According to Anderson, it is the 'expect the world from us' promise of the Oppy brand as the thread that ties strategy and execution together at Oppy. Sponsored by Deloitte, CIBC, Canadian Business Magazine, Queen's Smith School of Business, and the TMX Group, Canada’s Best Managed Companies program recognizes organizations that have implemented world class business practices and created value in innovative ways. The Platinum Club honors top-performing companies that earn a place among the best for six years or more. 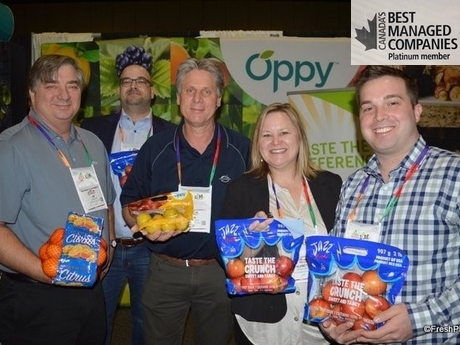 Oppy said the accolades recognize its 2018 achievements, including adding large scale value-added programs for kiwifruit and citrus in Western Canada, launching Frank & Able, a unique new brand of greenhouse tomatoes-on-the-vine, building the scope and scale of its Ocean Spray berry program, and developing high demand for Zespri® SunGold kiwifruit. Oppy was also recently selected as one of BC’s Top Employers for the third consecutive year.